The ideal product to prevent downward heat loss under tile & stone floors. 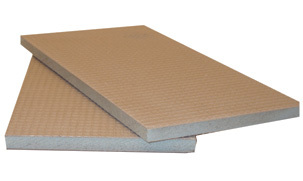 Ecomax is a lightweight insulated tile backer board developed specifically for the thermal insulation of tiled floors. It is constructed from an extruded polystyrene core covered on both sides by a glass fibre mesh embedded in a cement skin. Ecomax has exceptional compressive strength. Ecomax board provides excellent levels of thermal insulation & is a complimentary addition to any underfloor heating system. The high thermal resistance of the product prevents heat losses to the sub-floor. The use of Ecomax in conjunction with an Ecofloor Undertile Heating System will improve the responsiveness of the heating system by reducing heat losses. This will speed up heat up times and reduce running costs on an un-insulated floor. Ecomax board can be fitted directly over floorboards, chipboard and concrete floors. Produces greater rigidity & higher point loading than uncovered polystyrene boards. Close cell structure gives full resistance to moisture absorption - Waterproof. Keyed surface ready to receive tile adhesive. Easy to work with - Cut with knife or saw.